Without further a do, let's create a portfolio. Click on "Portfolios" menu item and click on Create a new portfolio button on the right hand side. You will see a dialogue where you need to select a domain for your new portfolio as displayed in screenshot 1. A portfolio is another website, which will be accessed via a URL. So it's a good idea to select a domain for it. If you have added a domain via "My Domains" page, you can select an existing domain from the drop down. Or if you want to add another domain, you can just type it in the text field. 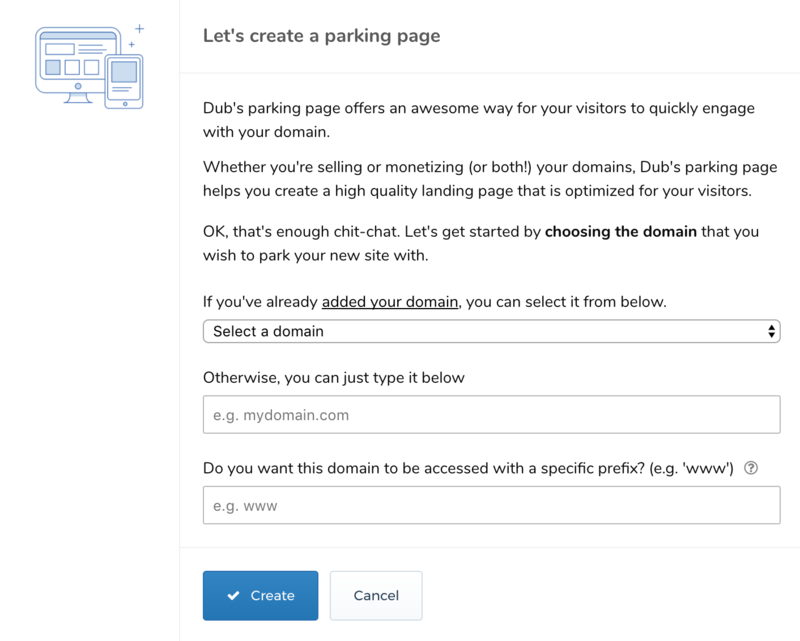 You will also see an option where you can have your parking page accessed via a prefix. A prefix to the domain is often called sub-Domain. An early convention for domains was to assign www prefix to indicate that the sub-domain www.mydomain.com was a World Wide Web page. This convention still exists but many pages now have their root domain (i.e. without the prefix) as their primary domain. Note that this is up to your preference. You can have either "www" or any other prefix. But it's important to keep things consistent. Once you have decided how it is accessed, Dub will make sure that all traffic is directed via a consistent URL format. Once you have selected a domain and a prefix preference you can click create to proceed to the next step.